It drove my mother crazy when I went barefoot as a kid. Still does, because I’m in stocking feet in the fall and winter and barefoot the rest of the time! Nothing startling there. But you might be surprised to learn that there’s scientific evidence that barefoot is better. Among other things, it’s important to the development of the nervous system and optimal brain development as well! It turns out the feet are the most nerve-rich parts of the human body, which means they contribute to the building of neurological pathways in the brain. Covering them in shoes, therefore, means we’re eliminating all kinds of opportunities for children’s brains to grow new neural connections. Why Do We Think Wearing Shoes is so Important? There’s also concern about injury. But being barefoot actually toughened up the bottoms of the feet, so unless children are walking through a construction site full of nails, the likelihood that they’ll injure themselves is slim. The truth is, many podiatrists contend that shoes can be much more harmful to little feet than nakedness can. Feet should be allowed to develop naturally, not conform to the shape of a shoe. Also, shoes can often constrict the movement of the feet, and can negatively impact walking, balance, sensory development, and proprioception (the understanding of our body’s orientation in the space around us). More on this topic from special contributor and YogaUOnline editor, Charlotte Bell – Foot Yoga: Tap Into the Power of Your Own Two Feet. 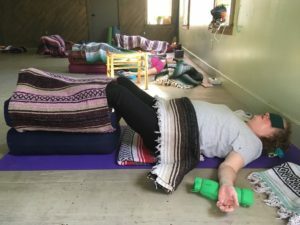 Body Sensing: Intuitive Yoga for Myofascial Release – A course from YogaUOnline and Yasmin Lambat. Rae Pica is an education consultant specializing in the development and education of the whole child. She is the author of 19 books, including her latest, What If Everybody Understood Child Development? : Straight Talk About Improving Education and Children’s Lives. Rae is known for her lively and informative keynotes for educators and parents and has shared her expertise with such groups as the Sesame Street Research Department, the President’s Council on Physical Fitness and Sports, Gymboree, Nike, and state health departments and schools throughout the country. Come to a comfortable seated or supine position, supporting your posture. Direct your attention inward. Keep your breath natural, not changing it at all. Focus on the length of the inhalation and exhalation. Notice the air moving in the nostrils and out of the nostrils. Where do you feel the breath? Do you fee lit as it comes in through the nostrils to the lungs and then out? Notice expansion in your ribs, your chest and any other expansive feelings in the body as you breathe in. Notice the release or relaxation of your body as you breathe out. Stay for at least 2 minutes of this breath awareness, working up to 5 minutes with practice. Benefits: Expands the chest muscles, opens the lungs, balances the glands, quiets the nerves and releases tension in the nervous system, increases oxygen intake to the brain, can stimulate the immune system (thyroid). stretch out lower back, release tension in the shoulders. Lay bolster lengthwise on mat and place one block at about 9 inches away from bolster and the other block about 9 inches from the first block. Place a strap around the middle of your thighs and tighten so that legs are hip distance apart. Sit on bolster and gently recline yourself down onto the blocks. Adjust the first block to be directly under the shoulder blades and adjust the other block so that your head is resting on it like a pillow. Shoulders should drape between the blocks. You may need to add blankets to the blocks for further comfort. Stay in pose for at least 5 minutes. Take care when rolling off the bolster and blocks. May bring knees to bend. Pause before lifting up to sitting. Benefits: increases circulation and helps venous and lymphatic flow from the lower body; relieves swelling and fatigue in the legs; helps relieve muscular skeletal stress in pelvis; quiets the mind and can help promote ease in meditation and sleep. Great variation if your hamstrings are tight or legs are aching. Begin with using a double-folded blanket to be placed right above sacrum or under hips (see photo), setting it approx. distance 6-8″ from bolster (adjust in pose). Sit down on the blanket and place your legs on the bolster. Arms rest by your side, palms face up or with Goddess arms. Variations: To ground legs, blanket or sandbag placed on belly or legs. Strap can be placed around calves, so you lose the feeling of holding up legs. Benefits: grounding, calming to the nervous system, allows the lymph to drain supporting the immune system, releases tension from the legs and feet, helpful for insomnia. Place one bolster vertically on your mat, lay a long blanket over it horizontally and then another bolster on top of the blanket. Lay your legs on top bolster and pull one end of the blanket over tucking under your legs. Other end of blanket lays over the first layer. Add a blanket to the belly and neck pillows for under the neck and wrists. Eye pillow for the eyes.